Glass is made by mixing several inorganic compounds at a temperature above their melting points, whose main ingredient is silica (sand or SiO2) that serves as the network-forming backbone of the glass. Silica has a very high melting temperature, and the molten mixture is then cooled down to produce a amorphous noncrystalline solid. Molten silica has high viscosity that makes it difficult to form into shapes. Adding soda (Na2O), the silica network is modified by disrupting some of the Si-O bonds, resulting in a lower melting temperature and viscosity, but introducing a reduced resistance to dissolving in water. Lime (CaO) can be used as network stabilizer, with increased durability and unfortunately tendency to crystallize, while Alumina (Al2O3) can be used too as an intermediate agent to resist crystallization process. Pigments can be used in minor amounts to produce colored glass: chromium oxide for green, cobalt oxide for blue, nickel oxide for violet, selenium for red, and iron plus sulfur and carbon for amber. Amber color provides the best protection for light-sensitive foods and beverages, filtering most of the light with wavelength shorter than 450 nm. 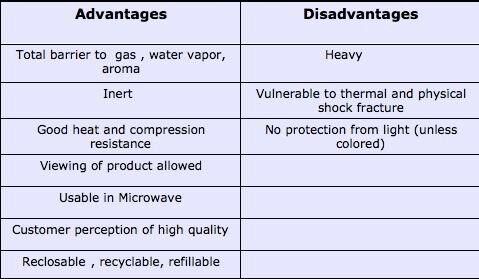 Advantages and Disadvantages of Glass Containers. Adapted from: Handbook of Food Engineering, Second Edition, Dennis Heldman, Daryl Lund CRC Press,2007,Taylor & Francis Group. Plastics are high molecular weight polymers that can be molded into desired shapes such as films, trays, bottles, using heat and pressure. Thermoset polymers when heated crosslink into a set network, often with addition of a crosslinking agent. For this reason, after taking on their original cast shape, they cannot be reheated for molding into new shapes. They play an important role in food packaging, often used for making package closures. They are often highly cross linked polymers, with properties similar to those of network covalent solids- i.e., hard, strong and brittle. Examples include bakelite and formica and epoxy. A thermoset polymer is one that doesn’t melt when heated, unlike a thermoplastic polymer. Thermoset polymers “set” into a given shape when first made and afterwards do not flow or melt, but rather decompose upon heating. A thermoplastic is a polymer that turns to a liquid when heated and freezes to a very glassy state when cooled sufficiently. 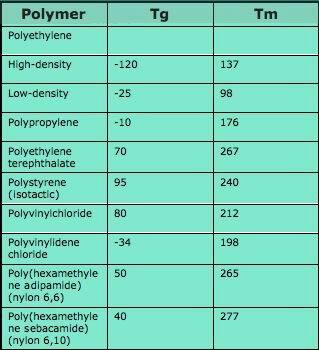 Most thermoplastics are high-molecular-weight polymers whose chains are associate through weak Van der Waals forces (polyethylene), stronger dipole-dipole interactions and hydrogen bonding (nylon), or even stacking of aromatic rings (polystyrene). Thermoplastic polymers differ from thermosetting polymers (like vulcanized rubber) as they can be remelted and remoulded, as thy soften and become molten when heated, then eturning to their original condition upon cooling. Many thermoplastic materials are addition polymers; e.g., vinyl chain-growth polymers such as polyethylene and polypropylene. Thermoplastic polymers links are linear or branched, without crosslinks between polymer chains. They can be molded or extruded repeatedly, and this property allows recycling for many uses after their use in food packaging. Thermoplastic polymers constitute the most important category of plastics used for food packaging, exhibiting a wide range of mechanical, optical, barrier, and thermal properties, depending on the specific polymer, polymer processing, and polymer additives. Additives can include plasticizers to improve plastic flexiblity, stabilizers to improve polymer resistance to degradation by heat and light, and antistatic agents to prevent plastics from clinging to packaging equipment. Polypropylene (PP). Thermoplastic with a good combination of physical, chemical, mechanical, thermal, and electrical properties. Highly resistant to corrosive materials. High temperature resistance and tensile strength. Excellent resistance to organic solvents and degreasing agents. In agriculture used for hampers and large trays in harvesting and transporting of raw materials to factories, (i.e. hampers in grapevine harvesting). Polyethylene (PE-LDPE-LLDPE) and polyethylene terephthalate (PET) Semi-crystalline thermoplastic with excellent wear resistance, superior dimensional stability. Resistant to moderately acidic solutions. Capable of sustaining high loads. Low moisture absorption. is used for packaging milk, beer, and juices. In agriculture, harvesting nets are also made of polyethylene. High density polyethylene (HDPE). Olefin-based polymers with excellent chemical resistance. Easy to machine. Highly resistant to abrasion and stress-cracking. Good water resistance. Used for bottles and canisters ,closures, buckets with lids and handles. Rigid polyvinyl chloride (PVC). Flexible, easily tailored for additional heat, chemical, and wear resistance. Good resistance to oil, low permeability to gases. Easily machined, heat-formed, and welded. Used for packages in collecting and shipping small fruits and vegetables. Also used in packaging edible oils, wine, vinegar, natural mineral water , etc. Polyester. Commonly used, when reinforced with fiberglass for tanks , storage container. Also used for storage of olive oil. Excellent strength and dimensional stability. Absorbs very little water. Good gas barrier properties and good chemical resistance. Polyester is chloride, alkali (caustic soda 4ºBé) and acid (pH = 4), resistant. Tanks made with polyester exhibit good mechanical resistance, acceptable durability, no metallic contamination in food products, and easy cleaning characteristics. Tanks are also used in production and storage of wine. In these cases, tanks range up to 500 m3 capacity, with 10 m diameter. Polystyrene (PS) Used for Desk accessories, cafeteria trays, disposable glass. Polystyrene food packaging is not recyclable. It comes in many shapes and forms, from foam egg cartons and meat trays, to soup bowls and salad boxes, coffee cups. Average Tg and Tm temperature for plastics in use in food processing (Differential scanning calorimetry (DSC) with 10 K/min). 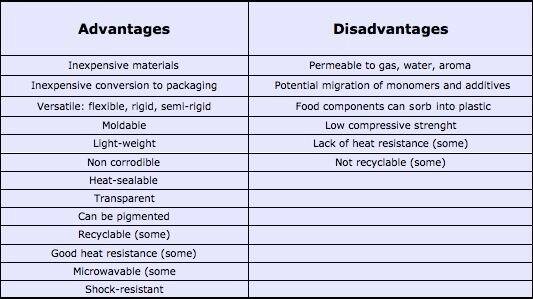 Advantages and Disadvantages of Plastic . Adapted from: Handbook of Food Engineering, Second Edition, Dennis Heldman, Daryl Lund CRC Press,2007,Taylor & Francis Group. Plastics are durable and degrade very slowly; the molecular bonds that make plastic so durable and strong make it equally resistant to natural processes of degradation. Burning is not the solution: in some cases, burning plastic can release toxic fumes. Burning the plastic polyvinyl chloride (PVC) may create dioxin. Prior to the ban on the use of CFCs in extrusion of polystyrene (and also in general use, except in life-critical fire suppression systems; see Montreal Protocol), the production of polystyrene contributed to the reduction of the ozone layer; however, today non-CFCs are currently used in the extrusion process. Thermoplastics can be remelted and reused, and thermoset plastics can be ground up and used as filler, though the purity of the material tends to degrade with each reuse cycle. There are methods by which plastics can be broken back down to a feedstock state, or compostable. To assist recycling of disposable items, the Plastic Bottle Institute of the Society of the Plastics Industry devised a scheme to mark plastic bottles by plastic type. A plastic container using this scheme is marked with a triangle of three cyclic arrows, which encloses a number giving the plastic type: see figure. Research has been done on biodegradable plastics that break down with exposure to sunlight (e.g., ultra-violet radiation), water or dampness, bacteria, enzymes, wind abrasion and some instances rodent pest or insect attack are also included as forms of biodegradation or environmental degradation. It is clear some of these modes of degradation will only work if the plastic is exposed at the surface, while other modes will only be effective if certain conditions exist in landfill or composting systems. Starch powder has been mixed with plastic as a filler to allow it to degrade more easily, but it still does not lead to complete breakdown of the plastic. Oxo-biodegradable (OBD) plastic is polyolefin plastic to which has been added very small (catalytic) amounts of metal salts. These as long as the plastic has access to oxygen (as in a littered state) these additives catalyze the natural degradation process to speed it up so that the OBD plastic will degrade when subject to environmental conditions. Once degraded to a small enough particle they can interact with biological processes to produce to water, carbon dioxide and biomass. The process is shortened from hundreds of years to months for degradation and thereafter biodegradation depends on the micro-organisms in the environment. Typically this process is not fast enough to meet UNI 14855 standards for definition as compostable plastics.